One EFFORTLESS Way to Wake Up with More Energy, Everyday! Do you find it hard to relate to the phrase, "Spring out of bed every morning"? You are not alone. So many of us wake up feeling very groggy and unable to resist the snooze button. Here I will tell you about one effortless way that you can wake up feeling at least a little bit more energized and ready to go! Don’t you just love watching the sunrise early in the mornings? Feeling its warmth wash over your skin as it slowly rises into the horizon? Sounds nice, doesn’t it? The idea of watching the sunrise has been idealized in our culture for decades. Yes, they are definitely beautiful. However, the truth is, that I, and most likely you, rarely actually see the sunrise. This is a bummer, because our ancestors reaped some great benefits by exposing themselves to the sunrise, nature’s alarm clock. When you wake up in your dark room, does it ever feel like a huge battle to get out of bed? And when you make it out of bed, do you feel pretty groggy for at least the next twenty minutes? This is very normal in our modern society. One major reason for that is because our bodies are not receiving any significant environmental cue (*cough* sunrise) that a new day is, in fact, beginning and we need to wake up! You see, when our ancestors were exposed to sunrises, their bodies gradually shut down their melatonin production. Melatonin is the sleep hormone that our bodies begin to secrete when it gets dark at night, putting us in a relaxed, and sleepy state. Today, when we wake up in our dark rooms, our bodies haven’t yet realized that we need to shut off this hormone so that we can begin our day. So, what can we do to tell our bodies to halt our melatonin production in the mornings (without sleeping with the lights on, of course)? Something I absolutely swear by is my sunrise alarm clock. It did seem a little pricey, but it's been worth every penny. I’ve had one for almost three years now and it has made every morning much more pleasant. While waking up to real natural light is obviously ideal, but we don’t all have access to a rooftop balcony and the streets aren’t exactly cozy, or we don’t always want to wake up exactly when the sun rises. So, 30 minutes before your alarm is set to ring, the sunrise alarm clock will turn on an incredibly dim light, gradually getting brighter and brighter until it is time to get up. Voila! Your body truly falls for this trick and thinks it has been exposed to a real sunrise! And yes, we’ve got some research to show this! 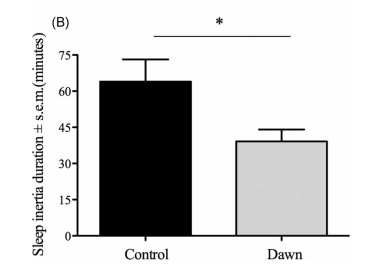 This study primarily looked to compare sleep inertia in individuals using a dawn-simulating alarm clock with individuals not using a special light alarm. Sleep inertia is the amount of time it takes for you to feel completely awake and aware (completely lose your grogginess feeling). The results were very promising. 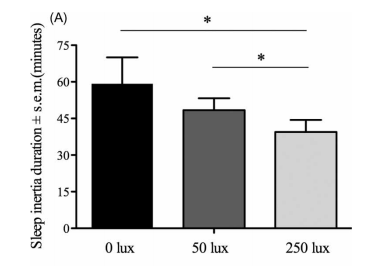 Not only did the groups using the light alarm have less sleep inertia, but the brighter the light setting, the more effective the sunrise alarm was! The benefits didn’t stop there. 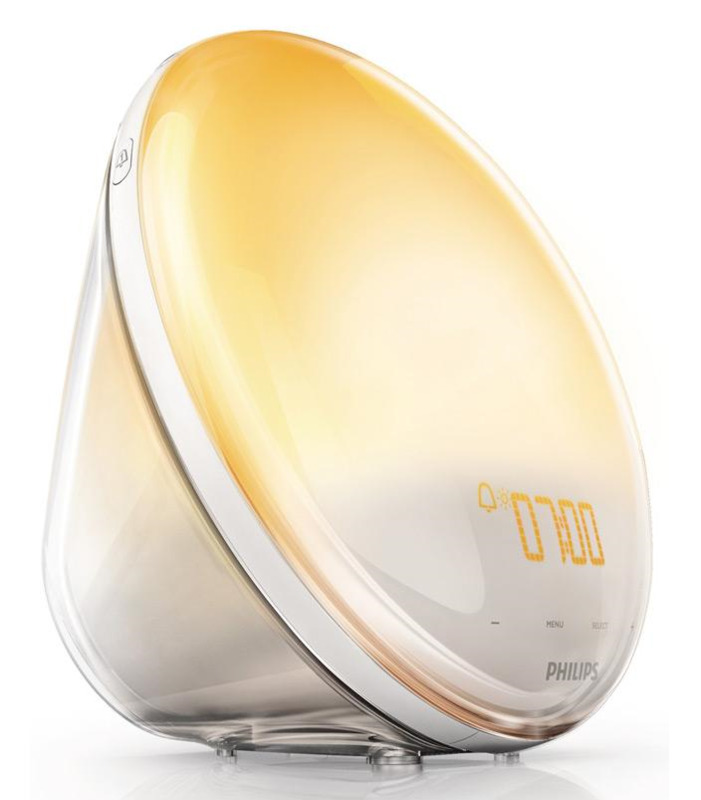 In the group using the sunrise alarm, participants noted benefits ranging from increased concentration, productivity and energy to a better mood! Now, if you know me, you know I am all about getting outdoors and in touch with the earth’s natural rhythms. But for now, this is the best option I have discovered to get the benefits of waking up to a sunrise without setting up camp in my backyard. I love being gently woken up by light instead of the same irritating ring tone or beeping everyday. And if the light doesn’t get me, I actually like the sounds of chirping birds it uses at the alarm noise. Don’t worry, chirping birds are optional and can be replaced with FM radio or buzzer. Once the alarm is purchased, it really takes 0 extra time or effort out of your day, and you get to wake up every morning with more energy! Also, since you’ve gotten this far, here’s some simple bonus tips to help you feel more energized in the morning. (I can’t help myself sometimes). 1. Get moving right away. Get your blood circulating! Stretch up high and reach for the ceiling. Do some judgment-free jumping jacks. 2. Don’t Snooze. Snooze sleep is not good quality sleep. You get no benefits from it and you actually wake up more tired. Trust me, I know this one is hard. I once gave up the snooze button for lent and was an hour late to school that first week. 3. Turn on the lights! Make it bright and let other lights in your home wake you up. Lastly, making sure you aren't suppressing your melatonin at night, before bed, is even more important to your health and sleep quality than addressing it in the morning. Learn more here. Now, I’d love to hear from you. How is your daily wake-up experience? Have you learned of any tricks over the years? Hi, I'm Andrew Sartory, M.Ed. As a functional medicine practitioner, I use cutting edge, comprehensive lab tests to help discover the root cause of your problems. I love helping relieve issues ranging from fatigue, depression, GI problems, autoimmune disease, weight gain, hormone imbalances and more!